We’ve been lambing – more about that shortly in La Petite Ferme section – tab above – which means we’ve been down in the vicinity of the pond a bit more often than usual. You really have to sit and look and analyse what you’re looking at. If you do that, you spot things like this. So what’s an exuvia? 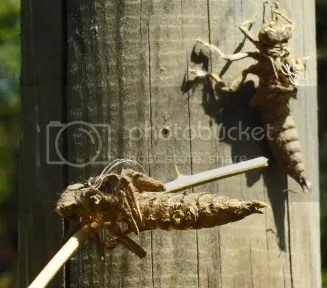 It’s the casing left behind when a dragonfly nymph (which has spent up to 5 years or more on the bottom of a pond) transforms itself miraculously into what – in this instance – I thought was a female Emperor Dragonfly. 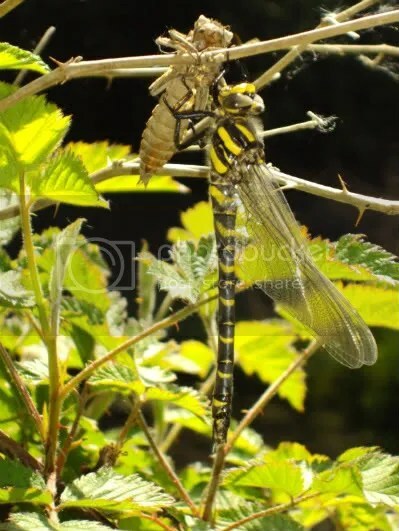 Not so – it is a male Golden-ringed dragonfly The magic is in how that long, elegant creature has managed to unfurl from that comparatively small casing. Apparently, after spending years on the bottom of a pond or river, the nymph emerges at dawn and climbs to a suitable place in order to emerge. The photo above was taken about 11am in the bramble clump at the side of the pond so it had probably exited the pond about 6 hours earlier. It was rather well camoflaged in the fresh green of the bramble leaves. In the top photo there are two exuvia – the first had flown by the time we spotted the empty casing; the second one was presumably allowing everything to harden and dry off before flying off to spend the next month or so feeding, mating, laying eggs for the next generation and then dying. A short-lived beauty.